6.4 arasında değişirken, kavram yanılgılarının ise %41.7-5.0 arasında değiştiği belirlenmiştir. açıklama oranından daha fazla olduğu tespit edilmiştir. of misconceptions of the eight-grade students’ on the subject of “element-compound-mixture”. Ayas, A.,& Demirbas, A. (1997). Turkish secondary students’ conceptions of introductory chemistry concepts. Journal of Chemical Education, 74(5), 518–521. Awan, A. S., Khan, T. M., Mohsin, M. N., & Doger, A. H. (2011). Students' misconceptions in learning basic concept'composition of matter'in chemistry.International Journal of Applied Science and Technology, 1(4). Balım, A.G. ve Ormancı, Ü. (2012). İlköğretim öğrencilerinin “maddenin tanecikli yapısı” ünitesine yönelikanlama düzeylerinin çizim yoluyla belirlenmesi ve farklı değişkenlere göre analizi. Eğitim ve Öğretim Araştırmaları Dergisi. 1, (4), 255-265. Ben-Zvi, R., Eylon, B., Silberstain, J. (1988). Theories Principles and Laws. Education in Chemistry. 25, 89-92. Briggs, H., and Holding, B. (1986). Aspects of Secondary Students’ Understanding of Ele-mentary Ideas in Chemistry: Full Report. Children’s learning in science project. Leeds: University of Leeds. Coştu, B., Ünal, S., &Ayas, A. (2007). A hands-on activitiy to promote conceptual change about mixture and chemical compounds. Journal of Baltic Science Education, 6 (1), 35-46. Gilbert, J. K., & Watts, D. M. (1983). Concepts, misconceptions and alternative conceptions: Changing perspectives in science education. Gilbert, J. K., Osborne, R. J., & Fensham, P. J. (1982). Children's science and its consequen-ces for teaching. Science Education, 66(4), 623-633. Kaptan, F. (1999). Fen bilgisi öğretimi. Milli Eğitim Basımevi, İstanbul. Kingir, S., Geban, O., & Gunel, M. (2013). Using the science writing heuristic approach to enhance student understanding in chemical change and mixture. Research in Science Edu-cation, 43(4), 1645-1663. Köse, S. (2008). Diagnosing student misconceptions: using drawings as a research met-hod. World Applied Sciences Journal, 3(2), 283-293. Papageorgiou, G. (2002). Helping students distinguish between mixtures and chemical com-pounds. Science Activities. 39 (2), 19-22. Karaer, H. (2007). Sınıf öğretmeni adaylarının madde konusundaki bazı kavramların anlaşılma düzeyleri ile kavram yanılgılarının belirlenmesi ve bazı değişkenler açısından incelenme-si. 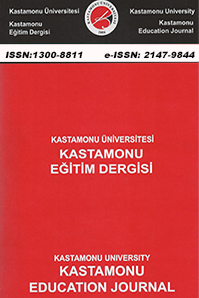 Kastamonu Eğitim Dergisi, 15(1), 199-210. Laverty, D.T., and McGarvey, J.E.B. (1991). A Constructivist approach to learning. Education in Chemistry, 28(4), 99-102. Myers, B. E., Washburn, S. G. ve Dyer, J. E. (2004). Assessing agriculture teachers’ capacity for teaching science integrated process skills, Journal of Southern Agricultural Education Research, 54(1), 74-85. Nakhleh, M.B. (1992). Why some students don’t learn chemistry. Journal of Chemical Edu-cation, 69(3), 191-196. Novick, S. & Nussbaum, J. (1982). Pupils’ understanding of the particulate nature of matter: A cross age study. Science Education, 65, 187-196. Palmer, D. (2001). Students’ alternative conceptions and scientifically acceptable conceptions about gravity. International Journal of Science Education, 23(7), 691-706. Posner, G.J., Strike, K.A. and Hewson, P.W. (1982). Accomodation of a scientific conception: Toward of conceptual change. Science Education. 66(2), 211-227. Sanger, M.J. (2000). Using particulate drawings to determine and improve students’ concepti-ons of pure substances and mixtures. Journal of Chemical Education. 77(6), 762-766. Schmidt, H.J. (1997). Students’ misconceptions-looking for a pattern. Science Education. 81(2), 123-135. Schoon, J.K. and Bone, J. W. (1998). Self-efficacy and alternative conceptions of science of preservice elementary teachers. Science Education, 82(5), 553-568. Stains, M., and Talanquer, V. (2007b). A2: Element or Compound? Journal of Chemical Education (inpress). Taber, K. S. (2000). Chemistry Lessons for Universities? : A review of constructivist ideas. University Chemistry Education. 4 (2) 63-7. ISNAD GÖKULU, Aytül . "8. Sınıf Öğrencilerin Element, Bileşik, Karışım Kavramlarını Anlama Düzeyleri ve Kavram Yanılgılarının İncelenmesi". Kastamonu Eğitim Dergisi 25 / 2 (March 2017): 611-626.